Form Description: Have you noticed how genealogy is becoming more and more popular as time goes by? It has become so popular that there are currently several different television shows dedicated to this potentially exciting branch of history. If you are thinking of getting into it, then you may want start keeping track of the research you are doing. The best way to do that is with this Genealogy Research Log. It is a great form to use to keep a summary of your research, and the results from that research, so you have that important information all in one location. This log can be a valuable tool in your efforts to find your past. This particular edition of the research log has been created using a fancy typeface. Just because you are doing some research into your family doesn�t mean that you can have a little fun. With this version of the form you can not only do your research, but have a bit of elegant fun as well. 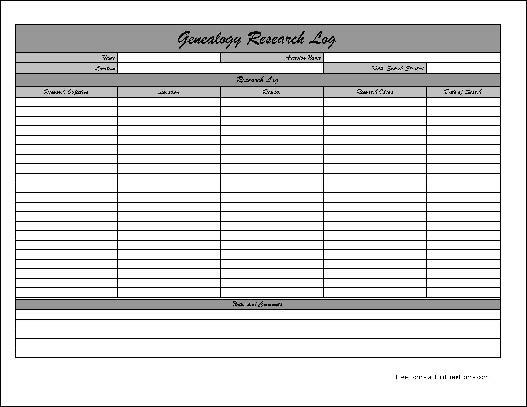 This form ("Fancy Genealogy Research Log") is associated with the following keywords: Genealogy, family, history, ancestor, research, results, logs, fancy.